The recent genome editing revolution has been fueled by the discovery and adaptation of highly specific endonucleases including meganucleases, zinc finger nucleases (ZFNs), TALENs, and CRISPR/Cas9. These genome editing technologies permit user-defined genome modifications by creating double-strand DNA breaks and exploiting endogenous DNA repair pathways to introduce DNA sequence changes. Genome editing has entered multiple clinical trials in a range of diseases including HIV, cancer, and hemophilia, and several preclinical successes have been reported for treating models of neuromuscular diseases, including Duchenne muscular dystrophy (DMD). 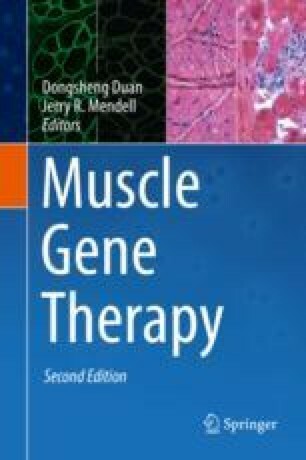 These studies include correction of numerous different mutations in patient-derived muscle cells and stem cells by a variety of genome editing strategies and endonuclease technologies. Preclinical studies have also shown efficacy of genome editing by restoring dystrophin protein expression and improving skeletal muscle physiology in animal models of DMD. This preclinical work highlights the potential for DNA repair therapy to treat DMD and other debilitating and fatal genetic diseases. Ongoing work seeks to address remaining issues including efficient delivery, addressing potential immune response or off-target interactions, and characterizing long-term safety and efficacy.